The Recess Program that Works! Are you tired of playground arguments and confrontations? Post recess discipline issues steal away a principal’s time and classroom teaching opportunities. Principals across the nation have turned to Peaceful Playgrounds Program for over 20 years to solve these problems. 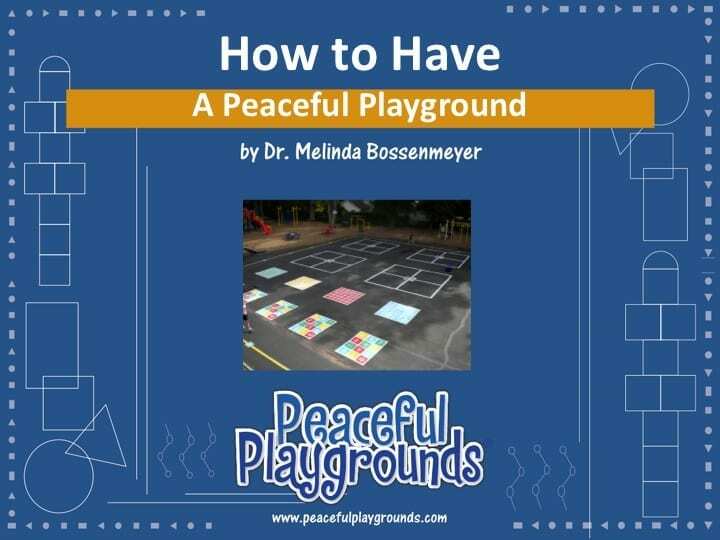 The Peaceful Playgrounds Program is in over 8000 schools across the nation which attests to its effectiveness in solving problems like bullying, playground arguments, and playground confrontations. The Peaceful Playgrounds Program is an inexpensive physical activity program that improves recess and overall school climate in before, during and after-school programs. Best of ALL children love the colorful transformation provided by the 100 NEW games and activity choices on the playground. Research on the Peaceful Playgrounds Program found that it REDUCES bullying, visits to the school nurse, visits to the principal’s office, and playground injuries while INCREASING the number of physically active children. The Peaceful Playgrounds Program is an inexpensive way to improve recess and overall school climate before, during and in after school programs. Best of ALL children love the colorful transformation provided by the 100 NEW games and activity choices on the playground. 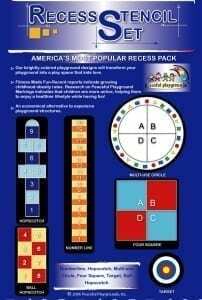 All components are included with the Peaceful Playgrounds Recess Program Kit. Research indicates that the more components you implement the better the results. 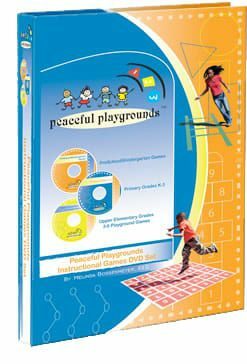 With the Peaceful Playgrounds Program kit you can design permanent playground activities that help make activity time more positive and productive: alphabet and number grids, hopping and skipping lines, and multi-use circles and squares are just a few of the nearly 100 game activities that can be permanently painted on the playground. 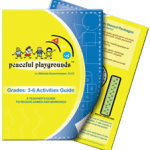 The Peaceful Playgrounds Program kit is intended to maximize the number of students involved in physical activity, rather than having them wait in line, or just stand around talking. The Peaceful Playgrounds Program is a nationally recognized and award-winning physical activity program touching nearly 2 million children annually. Peaceful Playground has given our recess area organization and a positive identity. The games are kid-friendly and age appropriate! 1. 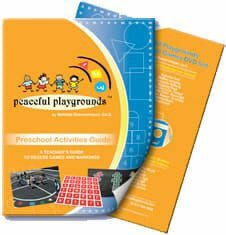 Scroll down to view the gallery below of products that are included in the Peaceful Playgrounds Recess Program Kit. 2. Watch the videos below that talk about the program. 3. Open the red bars below for a detailed explanation of the program components. Each of 4 Blueprints and Activity Guides assists you with measurements, layout, spacing, game placement, and overall design. 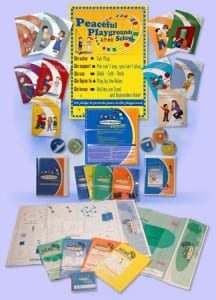 Also included are conflict resolution strategies, teacher training and playground supervisor training materials to complete the package and ensure success! Set up is easy and can be done by members of the school staff and parents. Each Blueprint lists suggestions for painting, placement, and recommended game markings for your asphalt playground layout. The Field Marking Blueprint has suggestions for your turf layouts. The Blueprints have companion rules guides which emphasize the five components of a Peaceful Playground and offer the specific rules, activities, for the game markings found in the Blueprint. 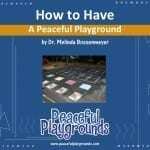 To ensure success, every staff member should be thoroughly familiar with all five components of a Peaceful Playground. 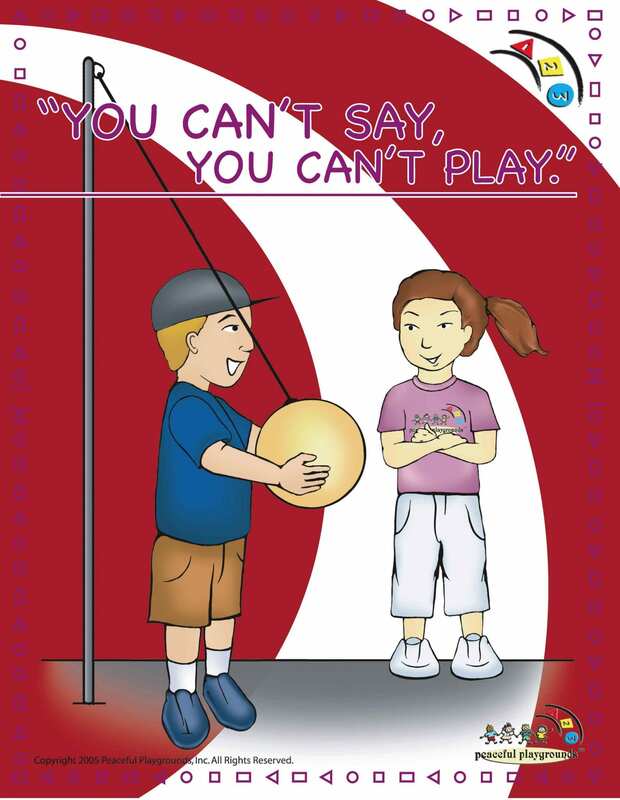 A Peaceful Playground Program DVD is included to assist you with staff and student training. 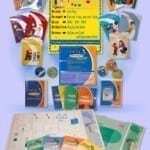 Guides and Blueprints, Stencils, Awards, Coupons, Certificates, Forms and Reports, program overview video, workshop training visuals, supervisor training handouts, and teacher workshop materials. A comprehensive set of playground equipment that will help you maximize your Peaceful Playground. 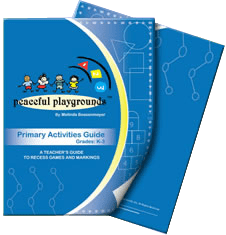 This equipment pack is a companion product to implement the dozens of games and activities outlined in the Peaceful Playgrounds Program Kit. 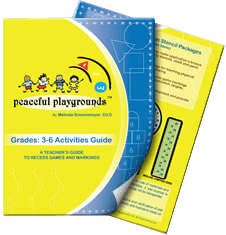 This Playground Equipment Companion Package is all the equipment you’ll need to fully implement the Peaceful Playgrounds Program at your school. New roll out stencils make application a breeze. No measuring! Just roll out the full-size activity stencils, chalk, and paint. Two easy to apply sets to choose from. 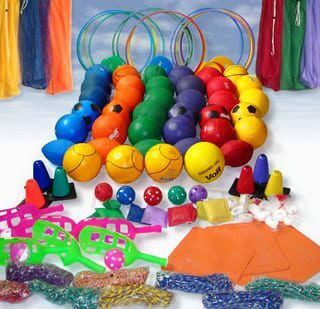 Brightly colored markings enhance motor skill development and provide activities for an outdoor motor learning lab. 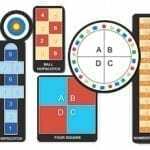 Recess Set includes 6 of the most popular recess game markings – Multi-use Circle, Hopscotch, Ball Hopscotch, Ball Target, Number Line and Foursquare. All stencils arrive complete with full game rules and lots of activity suggestions. 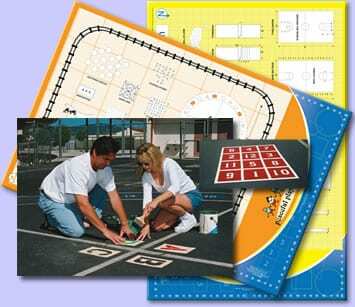 Stencils are made of plastic and are appropriate for use at one school site. They are approximately 8” x 12” high in size when cutting out. Now it is easier than ever to spread the power of the Peaceful Playgrounds Program! 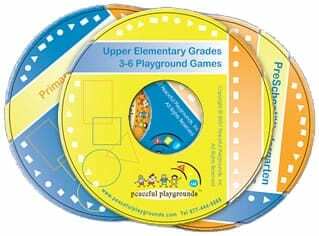 A ground-breaking set of three DVD’s and three accompanying Rules Guides is now available, that can be used by teachers and students alike, to easily learn how many exciting and constructive playground games are played! Learn how to create a playground that really works! 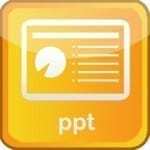 Navigate the easy-to-use menus to select any of over 25 games actually filmed being played by real students, games for Pre-school and Kindergarten, Primary Grades 1-3 & Upper Elementary Grades 4-6. These are games students will love, like Frog in the Sea, Scramble, Freeze Out, Number & Alphabet Grids, Four Square, and much more! 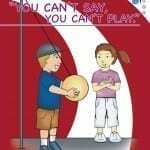 More than 25 elementary playground games and activities delivered in an instructional “how to play” format. Violations are also demonstrated and taught. 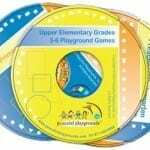 Each Games DVD comes with a companion rules guide which emphasizes the five components of a Peaceful Playground. The DVDs offer the specific rules and activities for the game markings. 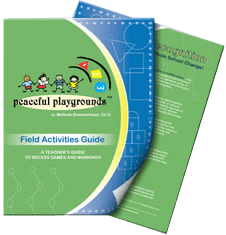 There are 4 Companion Peaceful Playground Activities Guides included for teachers and playground supervisor staff. Our latest guides now include Play Nice Parent Pages, playground behavior forms, equipment check-out form, playground safety rules poster, student injury form and much more! 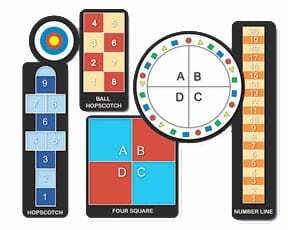 The Activity Guides provide a consistent set of rules for each game and give a program overview as well as playground report forms and equipment lists. 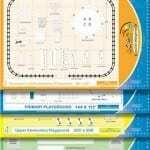 Good Sportsmanship Certificates and reward coupons are also found in the guide. Equipment suggestions will help with planning and overall organization of the Peaceful Playground Program. 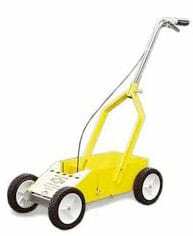 Our paint machine can be used on asphalt, cement and grass areas. The coordinated machine and paint work together to provide crisp, clean lines and bold marks quickly and professionally. 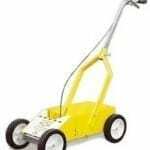 This high-quality paint striping machine features 7″ wheels to provide a smooth ride on hard surfaces, such as concrete and blacktop. Engineered and designed for easy operation and durability. Tips for painting the playground.